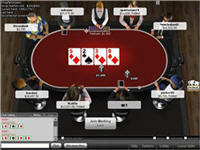 Winner Poker has maintained its position in the top 5 online poker sites with its ties to the iPoker network. They opened their doors in 2009 and, ever since, they have been well known for huge tournaments that are made even better by their impressive player volume. They claim to want to set a new standard in online poker, and their "Play the best, be the best" tagline draws in players of all skill levels. 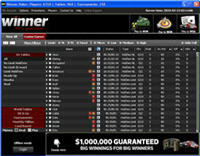 As part of the iPoker network it isn't surprising that Winner Poker has an impressive volume of players 24/7. This is a heavily European site and the peak hours are typical European hours. Winner Poker does not accept US players as the entire iPoker network is not very friendly to American players. This has not diminished the size of their player base as over 10,000 players can be found in the real money games during the heaviest traffic. At the moment, the iPoker network is second only to PokerStars in terms of traffic! Winner's "Play the best" motto certainly doesn't mean that every player who plays here is a pro. There is quite a large fish population and a skilled poker player can find it very lucrative here, especially at the micro stakes No Limit Hold'em tables. However, just like so many sites, the higher you go in stakes, the competition you fill face increases in quality and play is tighter and more aggressive. Take your time and really look for the easy games - ultimately, there's a table here for every type of player. Winner Poker is powered by Playtech, which means players get easy to use software that is safe and secure. Technical Systems Testing provides third partying auditing to ensure that all games at Winner poker are statistically fair. There are customizable decks and felt, the ability to mute table sounds, multi-tabling options, and the ability to reach customer service without leaving your table. The player stats offered by Winner Poker are very handy and even players who don't typically like to study their stats can find the graphical hand history useful. The user friendly software interface also has quite a few options when it comes to searching and filtering tables, and there are always separate tables available for players to play poker in Euros, Pounds, and Canadian dollars. Winner Poker has one of the largest sign up bonuses of all poker rooms at the moment, with a match bonus of 250% up to $2,000. Winner Poker is particularly accommodating in that they release bonus cash in $10 increments, instead of forcing players to wait to release the entire amount. They also make earning points very easy. Players typically earn around 2 points for every $1 of rake. This points program can be redeemed for cash, entries into exclusive tournaments, rake races, and even satellite entries. There are a number of different languages supported by the software and offered by the support staff. Winner Poker also offers a wide variety of options when it comes to contacting customer support. They offer phone, snail mail, email, and fax. There isa live chat option to players already logged in, as well. Regardless of the method you choose to get a hold of Winner Poker's staff, you can get help with any problems you may run into 24/7. In our experience, their staff is very knowledgeable and friendly, and the overall quality of their support (in terms of quickly resolving problems) is fantastic.